Derek Thompson, senior editor of the Atlantic, is one of my favorite writers. Although I frequently disagree with his views and politics, I appreciate any writer who can make me think and Thompson does a great job. I also appreciate his broad knowledge base and thorough research on any topic he investigates. 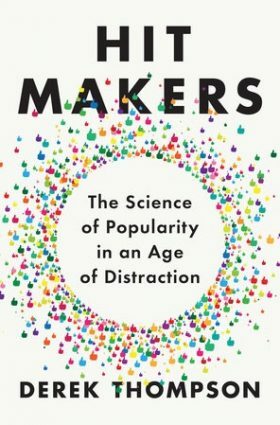 His first book, Hit Makers: The Science of Popularity in an Age of Distraction, does not disappoint. Contrary to what trendy marketers might tell you, nothing “goes viral” in today’s market. It’s far too complex and we are far too distracted for blockbusters to come out of nowhere. There are formulas to the products and services we love. Secrets hidden in plain sight. As audiences and market segments become more and more fragmented, it will be even more important to stick to the formulas for product and service design that create “hits.” For example, consumers love a “familiar surprise.” Thompson calls this a product that is “bold, yet sneakily recognizable.” The first Macintosh computer had folders and files organized on a “desktop” just like a real desk at work. Before Apple, computers were complex machines that required you to know programming language to get them to do anything. Jobs and his team changed all that by making something bold yet familiar – hence, the desktop and graphical user interface. When presenting new products or services to your target market, be sure to include “familiar surprises.” We make our reception rooms feel more like an upscale coffee shop than a doctor’s office and our new patient welcome kits have things that patients enjoy and understand like t-shirts, coffee mugs, chapstick, books and gift cards, in addition to the things they need to take care of their new braces. If you want your patients to talk about you and send referrals, this book is required reading in order to understand what gets people talking and what misses the mark. Of particular interest for orthodontic practice owners, read pages 46-69, 102-115 and 231-250 with a highlighter.